SUMMER TIP: Be on the watch for Hot Spots! Hot spots (superficial pyoderma or pyotraumatic dermatitis) are areas of moist, oozing, red skin infection that are incredibly painful and itchy for your dog. They can appear and worsen quickly. Anything that makes your dog chew or scratch themselves can result in a hot spot. All that is needed is a small scratch in the skin surface and under the right conditions the skin bacteria can take advantage and proliferate. What should I do if my dog has one? Seek treatment promptly as they can worsen quickly and are incredibly uncomfortable for your dog. Your vet will clip and clean the area and fit an E collar to stop further self trauma. The medications required differ depending on the severity of the condition and revolve around treating the infection and settling the inflammation. This often involves applying topical antibacterial & anti-inflammatories (medicated cream) and in more severe cases additional anti-inflammatories and antibiotics may be required. In mild cases, or if you are unable to seek prompt veterinary attention, clip the fur away using scissors and wash the area using a pet antibacterial shampoo (e.g. Pyohex) or a pet safe antiseptic (E.g. povidone-iodine diluted with water to iced tea colour) then pat dry. Take measures to stop further self trauma (e.g. apply an E-collar). Seek veterinary attention to ensure appropriate management of the infection and inflammation and to help identify and address any underlying issues. IMPORTANT NOTE: DO NOT assume human antiseptics or creams are safe for your pet’s skin as many can cause damage and irritation. Always seek veterinary advice before using human medications on pets. The aim is to keep your dogs skin clean, dry, non-itchy and well-aired. Regular washing. 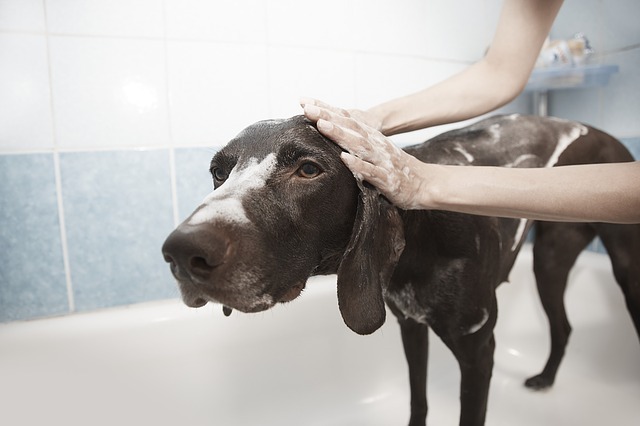 Our team can advise on best shampoos for dogs prone to itchy skin and skin infections. Groom long/ thick coated breeds over summer. Promptly treat and manage underlying predisposing conditions such as allergies/arthritis/ anxiety. If you are concerned about your dog’s skin please call us on 4779 5222 (Hermit Park) or 4772 1513 (Bayside).